With summer just around the corner, it’s time to think about cooling treats for the kids. Nothing says ‘summer’ quite like a popsicle (or ‘ice lolly’ if you’d prefer!) fresh from the freezer. However, these don’t need to cost a lot or come pre-loaded with sugar. In fact, with a little creativity and imagination, you can come up with frozen pops that not only taste delicious but are super healthy too! Of course, not everyone has the time to experiment or the budget for a machine, so here’s how you can make your own ice popsicles at home. To help busy moms stay one step ahead, we’ve done all the hard work for you. We’ve scoured the internet for the most interesting and hassle free frozen treats that your kids (and family) will love all year long. From sweet to spicy, healthy to the exotic, these recipes offer a variety of pops to please any fussy palate. 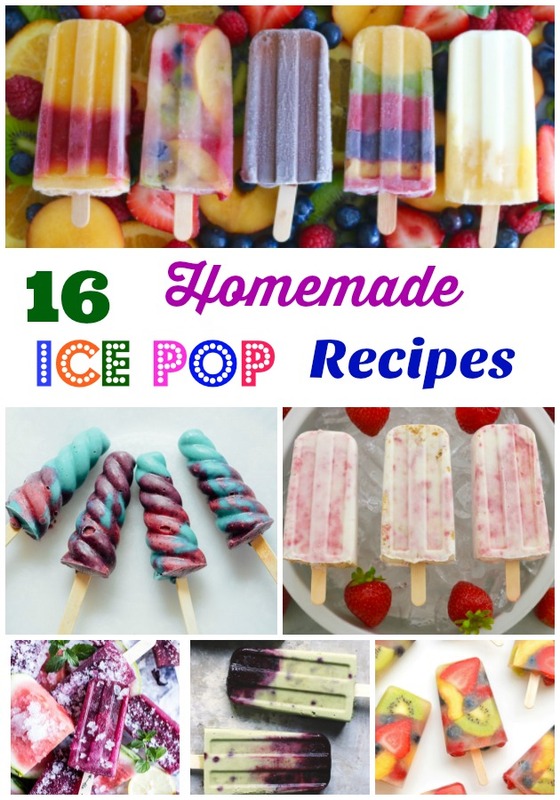 These fun and easy ice pops are also a great project for budding young chefs. Your child can pick their own ingredients, stir everything together, and pour into molds. What’s more, these recipes require minimal preparation yet provide the perfect opportunity to get the kids involved in the kitchen and learn some new skills. Don’t overfill the molds. Remember that liquid expands slightly as it freezes – and you still need to leave room for the stick, so only pour in just enough so that the liquid reaches just below the top edge – otherwise, you run the risk of them overflowing. If you don’t like too much texture or seeds in your lollies, just blend them for a bit longer or run any fruit/vegetable puree through a strainer. If you don’t have space for traditional lolly molds, then why not try and source some push-up ones instead? Fill the push-up pop containers with something other than ice-cream such as macarons, mini cupcakes, or a few marshmallows. They’re fun to eat, easy to make and a lot less messy. Frozen pops also provide a wonderful opportunity to inject a boost of nutrition into your kids’ diet – especially handy if you have a picky eater in the family. Try adding in probiotic ingredients like yogurt, kombucha or kefir, or sneak in some vitamin rich fruit juice or pureed veggies for added flavor, color and texture. Herbal teas and coconut water are other healthy options. Delicious additions: Layering ingredients takes things to another level, allowing you to combine different flavors for a more interesting taste and achieve some very pretty striped pops while you’re at it! More decadent ice pop add-ons might include variety of ice cream flavors, pudding or sherbet. Other fun ingredients you might want to experiment with include nuts, cookie bits or carob/chocolate chips. The sky’s the limit, so don’t be afraid to get creative! © 2019 Kiddit Toys - www.kiddit.com. All Rights Reserved.